Not much creating has been going on this week as we have a sick bubba in the house. I have been looking at the sewing machine, longingly, wanting to finish off a few things I started weeks ago. That's adorable, nice work! I hope your bubba is on the mend..
Aw the little owl is so cute - well done! Great job. I spotted this last week too, and must say you did an amazing job. Very cute owl. Hope your child is feeling better now (and you get some more creative time to recover with). 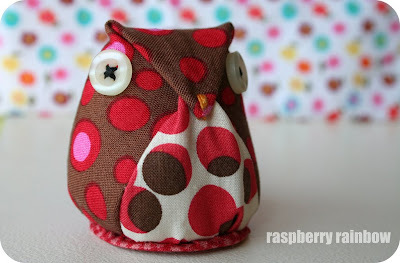 What a gorgeous little owl, love the fabric! Gosh Cat, he's adorable! I'm going to check out that tutorial. I'm madly gathering ideas for Christmas. Hope your little one is well again soon. I love anything owly so I'm going to have to make one myself! I've been working on my own little owl this week (a felt one for a mobile) so as soon as I'm finished I'm moving on to this one - thanks for sharing the tutorial link and I hope bubba is feeling better soon. Who can resist a cute little owl. He's gorgeous. Very sweet little owl. And a great way of using up little bits of left over (and gorgeous) fabric that you'd hate to waste! such a cutie. thanks for sharing the link!